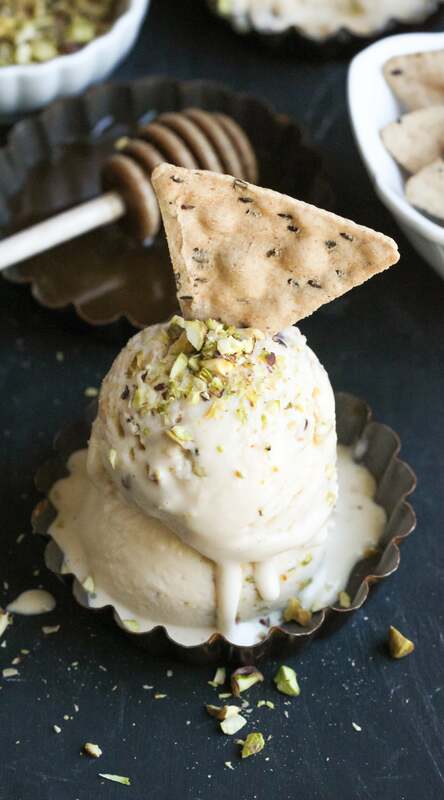 This deliciously sweet and creamy Healthy Baklava Ice Cream is laced with raw honey and studded with chopped pistachios and a crunchier, crispier, and more nutritious gluten-free substitute to phyllo dough. It seriously tastes like baklava swirled into ice cream. This is life. Baklava Ice Cream is life. Baklava is a traditional dessert from Greece that’s made with layers of phyllo dough, melted butter, chopped nuts, and honey. The entire recipe, from start to finish, can take up to 3 hours, and the difficulty level is pretty high since you have to work with delicate phyllo. Let’s skip all that and make ice cream, yes? I adapted my popular Vanilla Protein Ice Cream recipe to make this delicious variation. Both are basically the best-tasting things EVER. 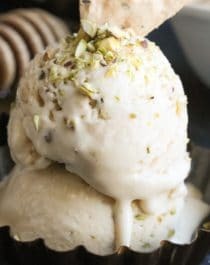 For this Healthy Baklava Ice Cream, I added honey to the “batter” then swirled in chopped pistachios and whole grain crispbreads that I broke into pieces. To replace the phyllo dough, which is the typical ingredient in classic baklava (made of white flour, starch, oil, and preservatives), I used Primizie Ancient Grains Crispbreads. They’re thick, crunchy, hearty, and addicting. Plus, they’re made with an array of whole grains, such as quinoa, brown rice, sorghum, teff, amaranth, and millet (gluten free and non-GMO too). These crispbreads are the perfect healthy substitute for phyllo in this ice cream! Every spoonful has the full essence of baklava in a cool and refreshing treat. You get the sweetness from the honey and stevia, richness from the pistachios and vanilla, and satisfying crunch from the crispbreads. Add an extra drizzle of honey and sprinkle of chopped pistachios. For good measure. 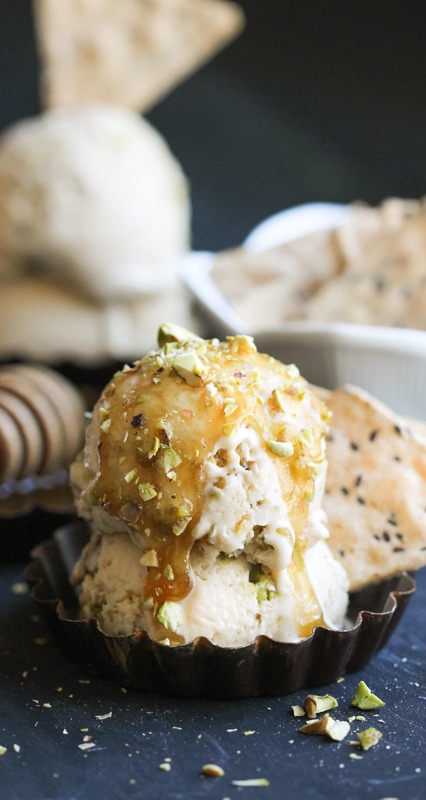 Who would object to a couple big scoops of this Healthy Baklava Ice Cream?? In a blender, add the yogurt, evaporated milk, honey, vanilla extract, stevia extract, and lemon flavor/zest. Blend until smooth. In a small bowl, whisk together the protein powder, xanthan gum, and salt. With the blender running, slowly add in the dry ingredients. Blend until smooth, then refrigerate. In a bowl, break the Primizie Crispbreads into small pieces. Mix in the chopped pistachios. 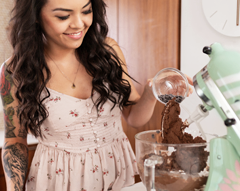 Place the frozen ice cream maker attachment onto the stand mixer and turn on the "stir" speed. Pour the ice cream mixture into the ice cream bowl and churn for ~15 minutes (it will thicken, but not turn into ice cream). Scoop the ice cream mixture into a freezer-safe dish and stir in the crispbread/pistachio mix. Cover and freeze until it's the texture you prefer (~4 hours). Serve and enjoy! After freezing solid, I find the best way to "thaw" the ice cream is in the fridge for a couple hours, rather than sitting on the counter or a quick blast in the microwave. Say WHAT?! 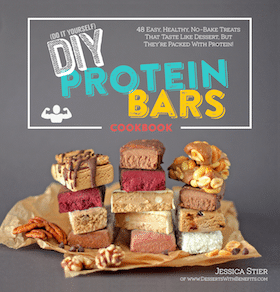 Just 170 calories and 6g fat per serving, plus a whopping 14g of protein? Yes, puh-lease. I think I’m psychic, because I’m envisioning A LOT of this ice cream in my future. This post was sponsored by Primizie. All opinions are mine and mine alone! Thank you for supporting the brands that keep Desserts With Benefits going! Looks amazing! My great grandparents were from Greece and My Poppo would make traditional Baklava for Easter. SOOOOO much butter on that poor Phyllo dough. It was delicious for sure but not healthy by any means. 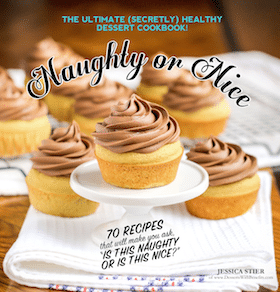 This ice cream looks refreshing and a much healthier way to enjoy the decadent flavors!